Ramalinga Reddy alleged that under Prime Minister Narendra Modi, India has become No. 2 in global beef exports, up from the third place earlier. Bengaluru: Taking a dig at the BJP over its "double standard" on the ban of cow slaughter, Karnataka minister Ramalinga Reddy today alleged that the country's beef export was flourishing under Prime Minister Narendra Modi's government. Recalling the statements of BJP president Amit Shah and Uttar Pradesh Chief Minister Yogi Adityanath during their visits to Karnataka that they would ban cow slaughter in the state after coming to power, Mr Reddy said killing of any animal was not right. "They (BJP) say that they will ban cow slaughter if they come to power in Karnataka, while our country exports cow meat, beef to other countries...it has been four years since they came to power, why have they not stopped these exports," he asked. Speaking to reporters, the state home minister said, "If they have real love for cows, they will have to first stop the exports." Mr Reddy alleged that under Prime Minister Narendra Modi, India has become No. 2 in global beef exports, up from the third place earlier. Brazil currently holds the first position, while Australia is third. The Congress minister said the income earned by the country during 2015-16 from beef exports stood at Rs 26,682 crore. "Does this mean for Rs 26,000 crore, they (BJP) are exporting beef and not banning it? If their sentiment about cow is true, let them stop it," he said. 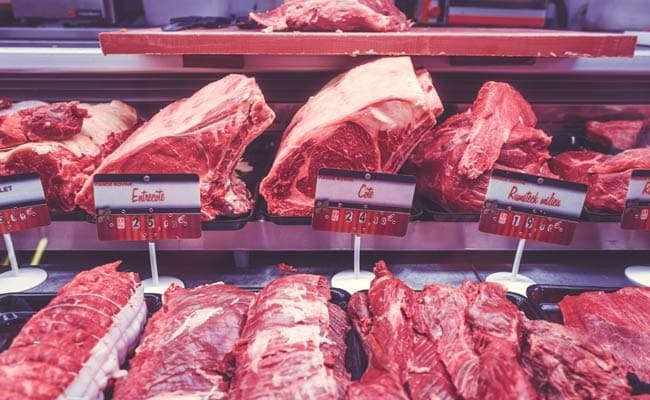 Citing data by the Centre for Monitoring Indian Economy data, Mr Reddy said under the Modi government, beef exports have seen a growth of about 14 per cent every year. BJP-ruled Maharashra and Uttar Pradesh have large number of beef processing and exporting companies, he said, adding there were allegations that BJP leaders were partners in these beef exporting companies in Uttar Pradesh. The Karnataka minister said in BJP-ruled Goa, 30 to 50 tonnes of beef is used every day, adding in many northeastern states where the BJP is in power, they are not ready for a ban on cow slaughter for "political reasons". "...they (BJP) are playing a drama...if they want to ban, let them ban everywhere and all animals. I will completely support it...let them first leave their double standard out," he said.